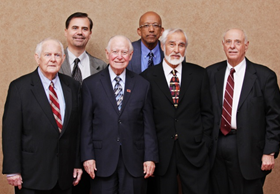 Justice Cruz Reynoso (first row, second from left) and former and current UNM Law School deans. First row: Emeritus Professors Fred Hart, Leo Romero and Robert Desiderio. Back row: Law School Deans Sergio Pareja and Alfred Mathewson. Photo courtesy of Robert Johnston ('16). Approximately 250 people attended the Mexican American Law Student Association (MALSA) Fighting for Justice Banquet at Hotel Albuquerque in Old Town on April 16. The Honorable Justice Cruz Reynoso of the California Supreme Court (retired) was presented with the 2016 Fighting for Justice Award. 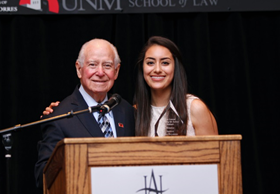 Reynoso taught at the UNM Law School from 1972 until 1976 and is known for being a strong force for change and a passionate voice for our nation’s disadvantaged. Justice Cruz Reynoso with MALSA president Jazmine Ruiz. Photo courtesy of Robert Johnston ('16). Leading attorneys, judges and local, state, and federal officials attended the event. Many UNM Law School faculty members were there, including Deans Alfred Mathewson and Sergio Pareja as well as four former deans – Emeritus Professors Robert Desiderio, Fred Hart, Ted Parnall and Leo Romero. 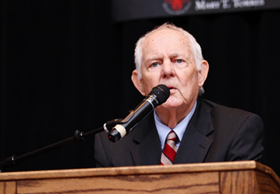 The keynote address was given by Emeritus Professor Frederick M. Hart, who was dean in 1972, and hired Reynoso, Romero, José Martinez and Richard Gonzalez, who were the school’s first Hispanic professors. Emeritus Professor Leo M. Romero introduced Reynoso. Emeritus Fred Hart hired Reynoso in 1972 and gave the keynote address. Photo courtesy of Robert Johnston ('16). Reynoso taught at the law school until 1976, when he was appointed to serve on California’s Third District Court of Appeal. A few years later, he was promoted to the California Supreme Court and was the first Hispanic to serve on that court. An award-winning documentary was created about Reynoso’s extraordinary life. Cruz Reynoso: Sowing the Seeds of Justice portrays the sting of injustice he felt as a child of farm workers and how he worked throughout his life to eradicate discrimination and inequality in an effort to make the promise of the American dream a reality for all. 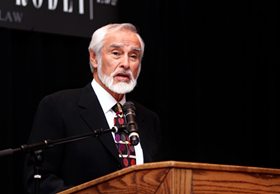 In 2000, Reynoso was awarded the United States’ highest civilian honor for his efforts to address social inequities and his public service. Emeritus Professor Leo Romero, who was hired at the same time as Reynoso, introduced the awardee. Photo courtesy of Robert Johnston ('16). The Fighting For Justice event benefits MALSA’s law student scholarships, education and mentorship initiatives throughout the year.